For most college students, summer months are often synonymous with the pool, the beach and plenty of rest and relaxation. But for one team of accounting students at the C. T. Bauer College of Business, summer was the time to pore over a company’s financial statements, compare competitors’ business strategies and craft a winning presentation for industry executives. Under the direction of faculty advisor Dr. Michael Newman accounting juniors Chris Huerta, Aimee Muniz and Raquel Ramos, along with accounting senior Antonio Sanchez, were regional winners at a recent case competition held in Washington, D.C., and sponsored by KPMG. 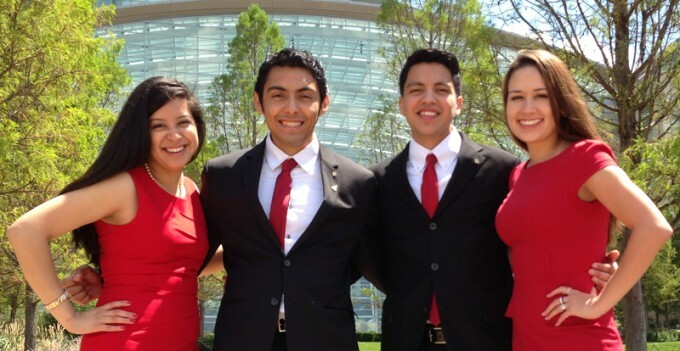 The student case study competition was part of the national convention of the Association for Latino Professionals in Finance and Accounting (ALPFA), a professional organization for Latinos in finance, accounting and related fields. 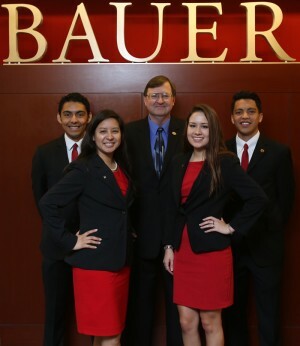 The Bauer team competed against dozens of teams from schools across the country to solve a complex accounting case and present their findings to KPMG and ALPFA professionals, giving them insight into the possibility of one day working at a Big Four firm. The competition required the team to examine their assigned company’s financial statements to identify potential risks in accounting and operations. In doing so, the team also worked closely with several professionals from KPMG, including Bauer alumni Tatiana Restrepo (BBA ’11), Lizette Viescas (BBA ’10) and Rolando Ventura (BBA ’11, MSACCY ’12). KPMG Partner Carlos Fernandez and Diversity Recruiting Manager Lorena Manobanda were also instrumental in helping the team prepare for the competition. The team credited their success at the competition to the guidance and coaching their KPMG advisors provided.